Phillip Smith recently wrote a featured story for Medium, "Judgment Day for Journalism," about the changing landscape of the media world. The subheadline goes: "As legacy news organizations falter, digital upstarts are scaling to meet demand." Smith starts off quoting media critic Jesse Brown, who notes that the number of journalists employed by small digital news companies is increasing. Brown writes, "building something from the ground up to suit the marketplace, to suit where profitability and sustainability is, is a lot easier than adapting something with all kinds of legacy costs into a sustainable model." Smith concludes from this that "we must reboot the media and start from the ground up." At RebelMouse, we agree. The old way of doing things is unsustainable. While The New York Times and a few other big news organizations will probably hold on for awhile longer, the real future of media lies in companies being slim and agile, focusing their efforts on content and good reporting without technological or institutional legacy costs. At RebelMouse, we offer an enterprise-level, centralized CMS solution for our clients so they don't have to hire an expensive developer team to build and maintain one themselves. This gives them the enterprise-level power of larger news organizations without all the overhead. Smith writes, "The simple truth is that journalism upstarts are getting better and faster, and their costs are coming down quickly." Smith calls for more "journalism entrepreneurship" and we agree. Investing in RebelMouse will move your needle forward and give you the platform you need to succeed on social and SEO with our powerful Entry Editor, Particle Assembler, and deep back-end technology. Our numbers speak for themselves: One of our media clients, La Verità, has seen, in the past three months, 400% growth on Facebook and 200% growth on Google. Another client of ours, Motherly, in the same period, saw 84% growth on Facebook and 440% growth on Google. And because we are constantly iterating our tech, you can stay far ahead of changing industry trends with our centralized updates. Unlike WordPress, updates to our system instantly go out to every site on our network without the need for painstaking manual development. 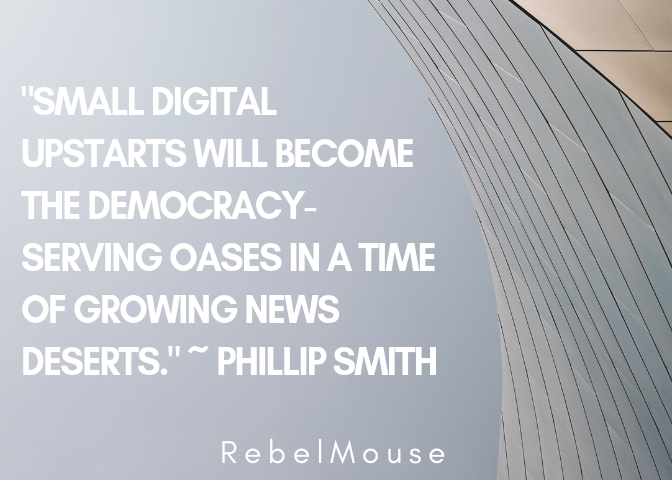 Smith is convinced that "small digital upstarts will become the democracy-serving oases in a time of growing news deserts." We agree. Which is why it's so important to have the right technology in place in order to scale as a small media company. While free CMS platforms like WordPress are great in the beginning, to really drive traffic in the new age of SEO you need the right mixture of technology and strategy. RebelMouse clients like Motherly are testament to the efficacy of our platform. Motherly launched on RebelMouse in early April 2018. Since then, they've shown explosive growth with users up 28%, sessions up 72%, and pageviews up a staggering 177%. Using RebelMouse's built-in SEO tools, Motherly began to optimize articles at the editor level. This has helped grow their traffic from Google. Since launch, users coming in from Google are up 1,164% and pageviews are up 2,018%. Smith wonders, "What would a network of "small is beautiful" news organizations sufficient to fill the widening gap in coverage look like?" At RebelMouse, we have already seen the future and we are a part of it today. Our network of clients have seen so much success that we are confident our technology will lead the way into the streamlined and beautiful future.